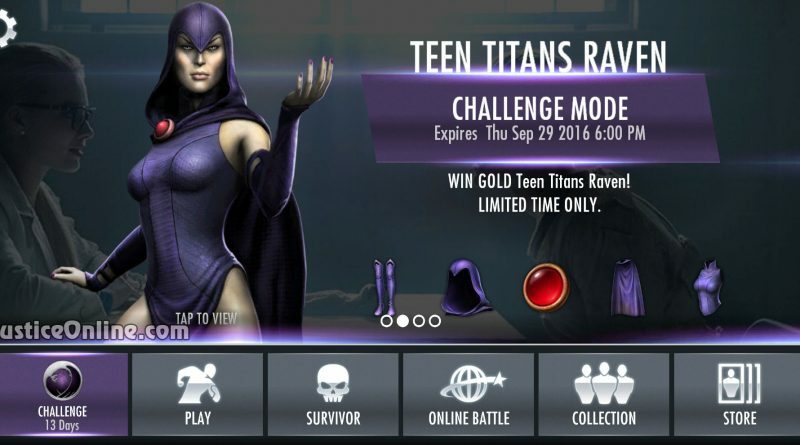 A next Single Player Injustice Mobile challenge has arrived and it gives you the chance to obtain Teen Titan Raven gold character. The character was added to the game in Injustice Mobile version 2.10 in June 2016 but the challenge was pushed back a few months due to the Injustice 2 and Suicide Squad challenges which had to be aligned to the announcement of Injustice 2 and the release of the Suicide Squad movie. Description: Special attacks have a chance to drain 25% Health and power. Raven receives all health and power that has been drained. To beat this challenge you must have Killer Frost, Scorpion and Hawkgirl on your team. All three of them are gold characters which might cause a problem for newer Injustice Mobile players. At the moment only Hawkgirl is available directly in the store through the Tag Team Pack. 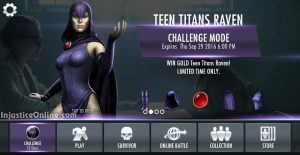 how do you get killer frost and scorpion to be able to compete in the challenge? There is no solution for this at the moment. Hopefully Netherrealm Studios will offer some packs for the characters. The Bleed Out Pack for Scorpion and the Ice Breaker Pack were just made available in the store. What is the challenge today???? ?